Gynecologist, Surgeon and Gynecologists Interactive Laparoscopic Wet lab Practicing Laparoscopic Tubal Sterilization, Salpingostomy, Ovarian Drilling, Hysterectomy, Cholecystectomy and Appendectomy Surgery on the Live Tissue. The gynecologist performed Tubal sterilization using Ring applicator on the live tissue. Today on the live tissue Dr J S Chowhan demonstrated the pelvic anatomy in the wet lab. He also demonstrated the use of the Ring applicator. 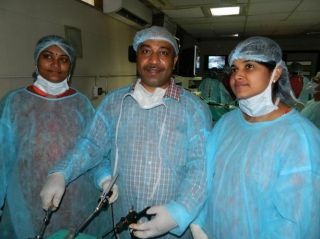 They learnt the use of Tritome in performing the Salpingostomy and ovarian drilling. Interrupted intracorpeal knots were used to close the salpingostomy. Laparoscopy hysterectomy was also performed and with the help of bipolar current the coagulation and cutting of the pedicles of the uterus was done. Monopolar current and the hook was used to do coplotomy. The vaginal vault was closed with the laparoscopy extracorporeal square knots. The surgeon today practice laparoscopy cholecystectomy and laparoscopic appendectomy. The doctors feel confident after completion of the procedure and said that this practice will boost their confident and will make the laparoscopic procedure easy.